—until his high school crush Drew Daniels walks through the prison gates one hot summer morning. On the run from a painful past that’s nearly crushed her faith in love, Drew is a new teacher at Lakeside Correctional. Graham, smitten all over again, tries to redirect his unrequited feelings. But when your heart keeps looking back, it's not easy to turn it forward. Amidst escalating violence at work, Drew is forced to confront her secrets, find a way to forgive old sins, and learn how to listen to her heart and her head when it comes to men. Graham must also learn to make peace with his own past. Together they realize that if you’re going to save yourself, sometimes the best way to do it is by saving someone else first. If only finding their way to one another was easier than working with convicted felons. Loaded with twisted humor and pathos, MANDATORY RELEASE is a darkly comic look at friendship, forgiveness, and love. A story about broken people putting themselves back together. People who learn that no matter what you lock up—a person, a secret, or your heart—sooner or later, everything must be released. You may have noticed that I tend to read a lot of dark books. I'm a fan of memoirs wherein the protagonist has a much crappier life than I do. I have a hankering to read about the seedy underbelly of life. I'm into gritty, dirty, twisty books that make me feel better about my own little first-world problems. So, reading Mandatory Release was like floating in a swimming pool with a cool glass of lemonade tucked in my cup holder. It was like a fresh stick of double-mint gum, like an ice cube rubbed on my sweaty neck. It was like a hard candy with a surprise center! (Thanks Katy Perry) All of that is to say that it was refreshing. This is the second book that I've read by Jess Riley. Just like the first, this one had me chuckling throughout. She is a seriously funny author, nearly every paragraph has a witty turn of phrase that made me smile. Lest you think this book is all fun and games let me point out that it also has its share of poignancy. Drew and Graham work in a prison. Graham is confined to a wheelchair. There are some shady happenings in Drew's past. It's not just a bowl of cherries people! 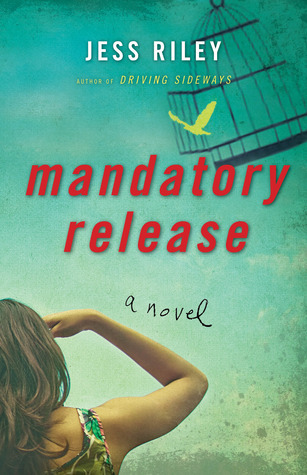 Mandatory Release is a quirky, tender, and complex tale that I heartily recommend. I'll have to see about checking this one out. Ha! I didn't even think of that! I hope you do check this one out, it'a a HOOT! Ha ha! I can relate. I am drawn to novels, memoirs, and movies about people who have much crappier lives than I. This sounds very good -- I can't resist quirky, tender, and complex -- and the prison setting intrigues me. Adding it to my wishlist. I can't resist quirky either ;) The setting is great! You had me at lemonade. I'm going to need to check this out! Mmmm, doesn't that sound great? The perfect summer drink! It was my pleasure Jess! :D Keep on writing chica, I'll keep on reading! I like lemonade and refreshing pool lounging. I could get into that. I've been curious about this one on Netgalley, I will have to check it out (it had great comparisons). I need something refreshing after zombie erotica. It's so nice to find an author you know will deliver a great read. This sounds like the perfect mix of serious topics and fun. Yes, exactly! I know I won't be disappointed! Who doesn't love making themselves feel better by reading about characters far worse off than you? It's far from depressing, I actually find it really refreshing! And if this is as refreshing as am ice cold lemonade on a boiling hot NJ day (currently a not so pleasant 98!) then I'm in! I'm glad I'm not the only one who loves to be depressed on behalf of someone else, lol. Oh man, the weather. Yuck. It's been crazy hot here too :( I'd take winter ANY DAY instead of this. Your thoughts on the book are great... like a cool ice cube- love it! Thanks for the recommendation. I hadn't heard of this one. LOL I didn't expect the refreshing lemonade and cool ice cubes comments, either! I haven't heard of this author, thanks for reviewing this. Oh I picked up on the prison right away. Certainly quite different than my usual fare, and that sounds good to me. I adore dark humor, too - this sounds like one I'd like! Did I mention how freaking FUNNY it is?? ;) Hilarious! Light and funny and prison? Sounds like a few of my favorite things! Ha ha that makes you sound like some sort of weirdo ;) But you're MY weirdo! I like the same kind of books so this sounds good! This sounds like a great summer read! Sometimes you need to break up the doom and gloom with a little bit of sunshine. Amen sister!! That is SO true! Quirky? Sounds like a nice read! Quirky for sure! :) Which is one of the coolest things a book can be, if you ask me!